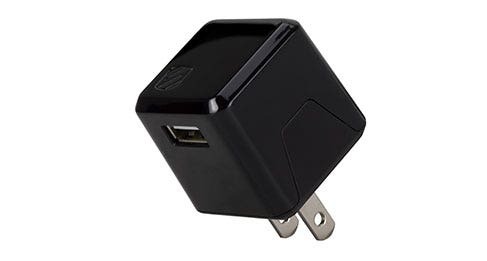 • FLUSH FOLDING: Wall prongs fold inside to make the charger even more compact in size. The StrikeLine™ Pro is the perfect charge and sync cable if you have a Lightning and micro USB device. Nearly any smartphone tablet or other portable devices will work with this 2-in-1 cable. A slim barrel design ensures that you can use StrikeLine Pro with nearly any case even backup battery packs. Various lengths of cable give you the freedom to use your device while charging or syncing. This cable features a slim barrel design so you can charge and sync your device when using a case (or a backup battery case). It has been designed to even work with the larger and more protective cases. This 2-in-1 cable uses a sliding adapter to let you charge and sync with either the Lightning or micro USB connector. Various lengths of cable give you ample room to charge your device while it's in use. Despite being 40% smaller than the closest competitor this charger can charge even the most power hungry tablets at the fastest rate possible. With folding prongs this compact 12 Watt USB Wall charger gets even smaller making it the best phone charger on the market.